In the picture, the Henry sure looks nicer. Actually to me the the Henry's stock looks very nice and barrel. Still think the H&R compared looks awfully nice to. Actually I think the receiver of the H&R looks more refined. Does that make sense? gsellers, I agree with you on the iron sights. I just wish I could use them, my 76 year old eyes require me to use scopes or else I shoot cylinder bore shotgun patterns instead of tight groups. Congrats on the Henry and when the snow is gone keep us in the loop as how it shoots. Take care, John. It is nice to know there is other means out there for a single shot 357 if you want one. Don't know if I ever will. Had two Marlins in 357 and got rid of both. Sure like my 45-70 though. Wouldn't mind a 30-30 in a handi either. Would hate to break the tradition of other than Handi's being in my collection. I'm sure you're Henry is a fine rifle. Congratulations. To me, the H&R looks more refined, just stole that word, and the Henry is squared off and standing too proud around the barrel. 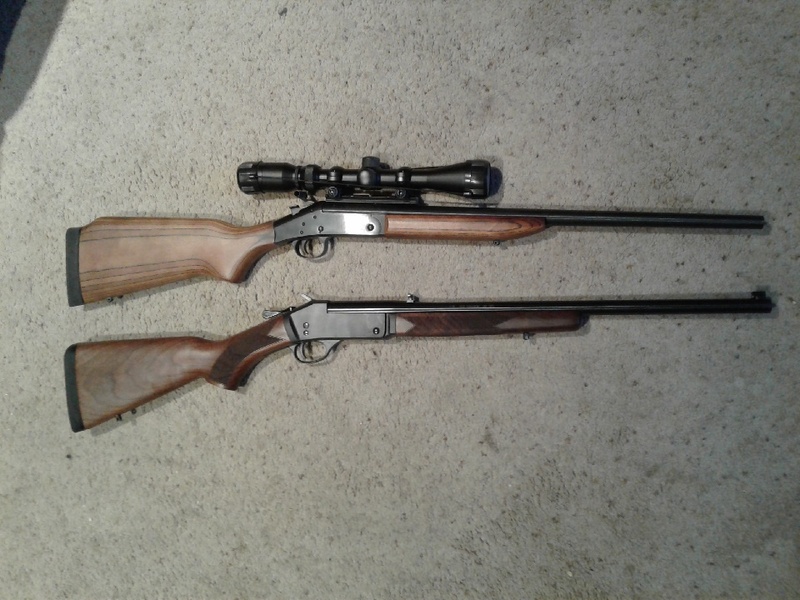 I think the H&Rs are handsome guns with nice clean lines. I personally think the H&R is better looking but I think there is more attention to materials and finish on the Henrys. I love iron sights and think guns should still have them. Fold down rear for scope mount is nice. The H&Rs were plain, not high polish on the barrels and pallet wood stocks that were bulky and a little proud at the receiver. Numrich arms has straight style stocks for about $35 I have them on a number of my H&Rs. I stained them in various finishes and high gloss spray urethane and they look terrific. I always put a white spacer on the buttstock which really adds to the looks. I have a 500 S&W handi with the laminated stock which I think looks really good too (that came with sights). I enjoy these single shot guns and just tinker with them. The Henry in that picture clearly looks better than the H&R... It just looks like a more refined rifle. For me, the Henry is the clear winner!